Host an unforgettable birthday sleepover. Celebrating a birthday is one of the most exciting times in a child's life. 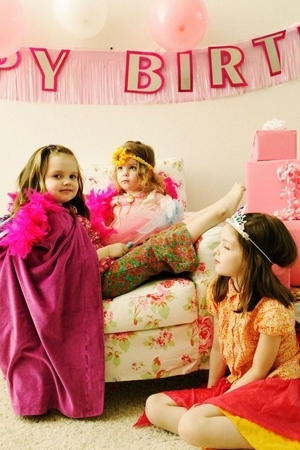 Since there is nothing more fun for a child than to spend an entire day and night with friends, a slumber party presents the perfect way to make the birthday girl or boy feel special. However, the idea of hosting a slumber party may give you thoughts of children running amok at your home as food is strewn everywhere. Really, though, it doesn't have to be that complicated! The following tips instruct how to host a successful slumber party. Allow your child to create invitations. Purchase blank invitation cards, stickers, and colored pencils to enable creative designs. Don't forget to include party details, such as asking guests to bring a blanket and pillow. Try to invite an even number of children so that no one is left out when a game or activity calls for partners. Since a slumber party is an all-night event, hang balloons from the ceiling by crepe paper. This decor will maintain the party atmosphere throughout the night, and your decorations will last longer being out of reach. The Paper Clip Game. Attach 10 paper clips together for each child. Have the children sit in a circle and detach each paper clip as fast as they can without changing the shape of the paperclips. The first person to complete the task wins a small prize. To enhance the excitement, play upbeat music during the game. The Mummy. Partners are chosen by drawing names (so no one feels bad for being the last person picked). Then, one child from each pair uses an entire roll of toilet paper to wrap his partner like a mummy. The first pair to finish the roll wins a prize. Provide snacks like a bowls of chips, a healthy veggie tray, and fruit around the party area. For dinner, allow the children to prepare their own meal to encourage interaction and creativity. Tacos are kid friendly and simple to make. Place taco shells, meat or vegetarian bean fillings, tomatoes, cheese, lettuce, and spices in separate bowls on the kitchen table. Distribute paper plates, and have each child put together a taco. Just add drinks to complete the meal. To simplify the cake and ice cream presentation, prepare the Cake Cone recipe ahead of time. It only requires three ingredients: ice cream cones, cake mix, and ice cream. Enjoy cake and ice cream in the convenience of a cone. Fill each ice cream cone with 1 tablespoon of cake mixture. Don't use too much mixture because it will rise, and you don't want it to overflow. Place mixture-filled cones on a cookie sheet. Bake them for about 10 minutes. Remove the cones from the oven, and cool them for about 15 minutes. Put candles in each cake cone and sing "Happy Birthday." Remove the candles. Add a scoop of ice cream in the additional space left at the top of the cone and serve. After the meal, everyone should be ready to wind down with a fun but low-key activity. Spread an old bed sheet or a drop cloth in the middle of the floor. In its center, place stickers, glue, foam shapes, markers, glitter, and similar items. Give each child a plain white T-shirt to decorate with these supplies. Once the shirts are complete, hang them up to dry. Return them to the children at the end of the party. When it's time for bed, allow the children to sleep in the TV room on the floor watching an age-appropriate and engaging movie they've chosen. Before long, they'll likely relax and fall asleep. Once the party is over, provide tortillas, cooked eggs, and cheese on the breakfast table so guests can make breakfast burritos and heat them in the microwave. As they watch a little television and talk, their parents will soon arrive to pick them up. Your child and little guests will have memories that will last for a lifetime. Felicia Harris is an instructor of Chef’s Delights cooking class in Mesquite, Texas, where children ages 4 to 6 years prepare easy-to-make, healthy meals. She is the author of children’s cookbook Slumber Party Recipes (CreateSpace), which can be found at Amazon.com.